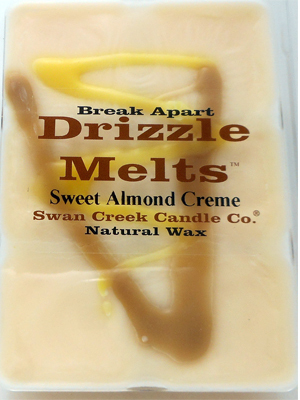 I first want to say I purchased these drizzle melts from a site called Cape Candle. They are a retailer of Swan Creek and actually have lower prices. SCORE!! They don’t carry every scent Swan Creek does but still enough to enjoy and… they offer free shipping. A definite plus to us wax shoppers. Relax with the richness of fresh Sweet Almonds. That description doesn’t really tell you much. Smelling the wax however tells you all you need to know and I must say… it truly smelled exactly like the name itself… sweet almond creme. The almond is the strongest, reminding me of an almond extract but the creme component really smooths it out. It smelled yummy. Swan Creek’s drizzle melts are pretty large so one cube per melt session works great. In my case, I used two cubes in two separate electric melters in my great room. Once melting… holy mackerel! The aroma moving through my great room was almost instant and wow was it good. A heavy cream with almond filled my great room and it was super rich and strong. LOVED!!!! I must say, I’m not usually a huge fan of heavy almond scents but this one was amazing. Just imagine the sweetest cream with a heavy dose of almond blended throughout. It smelled like pure bakery and I’m definitely purchasing more in the near future. It was that good. Strength – I would rate this candle a 10 out of 10 in any size room. It’s a room filler. You don’t have to be an almond fan to try this one, trust me. I’m not and I loved it. Definitely pick up this scent if you love bakery scents. I think you’ll love it. I did.